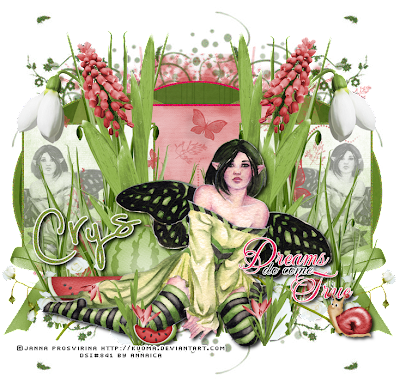 For this tag, you'll wanna pick up the very beautiful and colorful PTU kit called WATERMELON FANTASY by Creative Scraps by Crys. It is available in full size and taggersize... Check out how to get that HERE. I used this perfect fairy PTU tube by Janna Prosvirina called BLEEDING HEARTS, which requires a license to use. Go to Dreamscape Imaging to get it! And I used a FTU template from the fairytales pack over at Amy & Leah's Gimptastic Tuts, just click HERE to snag that. This tag is for experienced Gimpers! 1. Open template. Delete bottom (white) layer. Alpha to Selection- temp- frame 3. New layer. Fill with a deep pinkish red. Add noise. Delete original frame 3. Alpha to Selection- temp- frame 2. New layer. Fill with light green shade, add noise. Delete original frame 2. The same with frame 1 in temp. 2. Alpha to Selection on circle 1. Add layer. Grow by 3. Fill with same light green shade. Add noise. Repeat with circle 2. For circle 3, fill it with the deep pinkinsh red shade and add noise. 3. Open as layers paper 13. Add alpha Channel. Alpha to selection on circle 3 layer. SELECT>INVERT & EDIT>CLEAR while paper layer is active. Open as layers paper 15. Add alpha Channel. Scale to 700 x 700, duplicate, flip. Link two papers and center then merge. Alpha to Selection circle 1 and 2. SELECT>INVERT & EDIT>CLEAR while paper layer is active. Open paper 1 as new layer. Add alpha Channel- use in next step. 4. Open as layers mask 7. COLOR>INVERT then LAYER>TRANSPARENCY>COLOR TO ALPHA. Alpha to Selection. SELECT>INVERT & EDIT>CLEAR while paper layer is active. Delete original mask layer. Open up mask 17. COLOR>INVERT then LAYER>TRANSPARENCY>COLOR TO ALPHA. Colorize to dark green. Add noise. This mask above the paper mask. 5. Open as layers paper 11. Add alpha channel. Scale to 400 x 400. Alpha to Selection square 3 in temp. SELECT>INVERT & EDIT>CLEAR while paper layer is active. Open paper 6, add alpha channel, scale to 400 x 400 and duplicate then position each above square 2 & square 1. Merge paper layers. Merge square 2 & square 1, then Alpha to Selection. SELECT>INVERT & EDIT>CLEAR while paper layer is active. Delete original template layers. 6. Colorize the DREAMS and TRUE layers of wordart to that watermelon color. 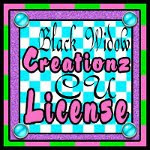 Colorize DO COME layer of wordart to black. Colorize all back layers of wordart white. Add a drop shadow. Merge the wordart layers. Make invisible for now. 7. Open as layers the tube of choice. Scale down tube 2 layer. Desaturate. Duplicate and flip, position appropriately. Merge these two layers. Alpha to Selection the paper 6 layer. SELECT>INVERT & EDIT>CLEAR the tube layers. For the tube 1 layer, make invisible for now. Keep the tube credit info handy. Delete any other layers that opened with tube. 8. Open as layers bow 4 and scale down. Place on left side, duplicate and flip. Place on right side. 9. Open as layers butterfly scatter 2. 10. Open as layers grass, scale down a bit, duplicate and flip. Merge these two layers. Duplicate and flip the copy, place accordingly. 11. Open flower 3, duplicate and flip. 12. Open flowers 2, duplicate and flip. 13. Open roses, duplicate and flip. 14. Open watermelon 2 and scale to 255 x 167. Add drop shadow. 15. Make tube 1 layer visible, bring to the top. Add drop shadow. 16. Open Flowers 4 and scale to 150 x 154. Duplicate and flip. 17. Open watermelon slice and scale to 80 x 38, add drop shadow. 18. Make wordart visible and bring to top layer. 19. Open snail as new layer and scale to 83 x 82. Add drop shadow. 20. Use your copyright info to correctly credit the source of the art. Copyright symbol, artist's name and website, along with your license number must be clearly legible. 21. Add text. I used a FTU font called Lexi by MissTiina fonts, you can read her TOU by clicking on the left sidebar on my blog- where her little sticker is. I did text that light green shade, grew selection by 2, filled with white and linked two layers, rotate and then add drop shadow to white text layer. 22. Crop using rectangle select tool.